Billy Moore was born on May 22, 1933, in Greensboro, North Carolina. He enlisted in the U.S. Army on June 2, 1950, and completed basic training and Armor School at Fort Knox, Kentucky, before serving in Korea from 1951 to 1952. MSG Moore returned to Fort Knox from 1952 to 1953, and then served at Fort Campbell, Kentucky, for a year before serving in Japan from 1953 to 1956. His next assignment was as 1st Sergeant of Company D, 44th Tank Battalion at Fort Bragg, North Carolina, from June 1956 to July 1957, followed by service as 1st Sergeant of the 82nd Airborne Reconnaissance Company at Fort Bragg from July to September 1957. He served as an Armor Intelligence Specialist with Troop A, 17th Cavalry Regiment at Fort Bragg from September 1957 to June 1958, and then as a Light Weapons Infantry Leader with the 77th Special Forces Group at Fort Bragg from June 1958 to June 1960. During this time, MSG Moore attended Persian Language training at the Defense Language Institute in the Presidio of Monterey, California, from September 1958 to August 1959. His next assignment was as Team Sergeant with Company B, 7th Special Forces Group at Fort Bragg from June 1960 to February 1961, and he then attended Radio Operator training at Fort Gordon, Georgia, from February to April 1961. MSG Moore served as an Operations Sergeant with Company D and then Company B, 7th Special Forces Group at Fort Bragg from April 1961 to November 1962, and then as an Operations Sergeant with Company C, 10th Special Forces Group in West Germany from November 1962 to August 1965. 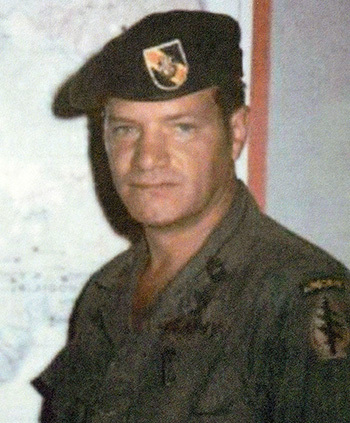 His next assignment was as an Operations Sergeant with Company D, 7th Special Forces Group at Fort Bragg from August 1965 to May 1966, followed by service as an Operations Sergeant with the Studies and Observations Group, Military Assistance Command in South Vietnam from May 1966 to May 1967. He served as an Operations Sergeant with Company B, 3rd Special Forces Group at Fort Bragg from May 1967 to January 1968, and then served as an Operations Sergeant with Company C, 6th Special Forces Group at Fort Bragg from February 1968 to February 1969. MSG Moore next served as an Operations Sergeant with Company B, 5th Special Forces Group in South Vietnam from February 1969 to February 1970, followed by service as an Operations Sergeant with Company C, 6th Special Forces Group at Fort Bragg from February 1970 to March 1971. During this time, MSG Moore served on the Headquarters Element of the Blueboy Assault Group during the Son Tay Raid, a clandestine mission to rescue American Prisoners of War in North Vietnam on November 21, 1970. His next assignment was as an Operations Sergeant with Company C and then Headquarters Company, 5th Special Forces Group at Fort Bragg from March 1971 to June 1972, and then as Sergeant Major of Company B, 3rd Battalion of the 5th Special Forces Group at Fort Bragg from June 1972 to May 1974. CSM Moore served as Command Sergeant Major of 2nd Battalion, 78th Field Artillery Regiment of the 1st Armored Division in West Germany from June 1974 to August 1976, and then as Command Sergeant Major of the 407th Support Battalion, 82nd Airborne Division at Fort Bragg from November 1976 until his retirement from the Army on September 1, 1979. Billy Moore died on June 22, 1999, and was buried at the VA Cemetery at Fort Bragg, North Carolina. Master Sergeant Billy K. Moore, United States Army, distinguished himself by gallantry in action on 21 November 1970 as a member of an all-volunteer joint U.S. Army and Air Force raiding force in the Joint Chiefs of Staff directed heliborne assault mission to rescue United States military personnel held as prisoners of war at SON TAY Prison in North Vietnam. Immediately after the helicopter in which he was riding crash-landed inside the prison compound, Sergeant Moore delivered devastating automatic weapons fire on the southwest guard tower, thus eliminating its threat. Then, with great risk to his life, he moved to the south wall and continued to place fire on the enemy target until it was completely cleared. Sergeant Moore then moved unprotected with a demolition charge to a pre-selected position to blow an escape hole in the prison wall for evacuation. Upon completion of this task, he volunteered to remain behind to activate the prepared demolitions charge in the crash-landed helicopter in order to destroy it. His fearless personal conduct, thorough execution of his assigned tasks, and his calm and efficient manner of performance were exceptional during the critical assault period. Sergeant Moore's conscious disregard for his personal safety, extraordinary heroism against an armed hostile force, and extreme devotion to duty are in keeping with the highest traditions of the military service and reflect great credit on him and the United States Army.